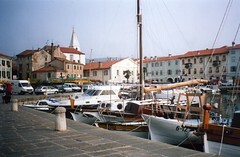 Izola (Isola d’Istria) is an old fishing town on the coast of the Adriatic Sea. The old town stands on a limestone peninsula jutting into the sea from a small plain. The new town developed on this plain, linking the old town with the nearby settlements. An old Roman settlement known as Haliaetum stood on this site as early as in the 2nd century. The town itself was established by refugees from Aquileia in the 7th century. After Koper, Izola also came under Venetian rule. 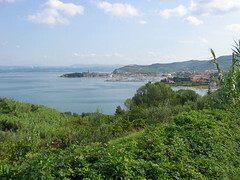 Izola was once an island (Italian: isola), but during the Napoleon’s occupation in the early 19th century, the city walls were used to fill in the channel that separated the island of Izola from the mainland. Today Izola has many hotels near the sea, a well known discotheque, many painter’s galleries, summer concerts in the streats and a movie festival. The hotel settlement Simonov zaliv in Izola is surrounded by splendid Mediterranean vegetation on the Slovenian coast. Once this was the ancient Roman port Haliaetum. Even today, when a strong ebb-tide appears, one can still admire the jetty remnants with mosaics hiding under the sea level. The Belvedere hotel is located at the very heart of Slovenian coast, near the road from Izola to Portoroz, on a hill overlooking the Bay of Trieste. The premier Slovenian club Ambasada Gavioli is also one of the european’s best dance clubs. Ambasada Gavioli regularly brings in DJs from around the world to play techno, trance, funk, and fusion. Location: just outside the city in the city’s industrial area.